Below you will find all usefull information of Names4ever and in the left menu you can navigate to other subjects. The European ringsize is actually the diameter of the inside of the ring. Size 16 thus is equivalent to 16mm. The size of the ring is determined by measuring the inner diameter of a ring. It is actually quite simple. 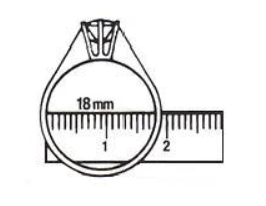 On average the ringsize of a woman is between 16.5 and 17.5mm and with a man it is around 20.5mm. If you doubt between two ringsizes, choose the largest one. Measure the size of another ring that already fits. You can use our Fitting rings as well. As soon as the ring is ordered it cannot be returned anymore. Therefore please be aware of the ringsize you order!